A wine that’s going to rival or surpass the 2015, the 2016 Châteauneuf-du-Pape Cuvée Réservée shows the quality of this awesome vintage with its deep, powerful, concentrated style. While Laurence says her 2015s remind her of her 2010s, I find a certain 2010-like purity in this wine as well as killer notes of black raspberries, blueberries, garrigue, and pepper. Possessing both power and finesse, full body, sweet tannins, and a great finish, don’t miss this beauty. Still in foudres, the 2016 Chateauneuf du Pape Cuvee Reservee is even more impressive than it was last year. It's still firmly tannic, but the fruit seems to be growing in stature, adding volume and richness sufficient to round out the tannins. This full-bodied, concentrated wine offers hints of mocha and raspberries, but it seems a bit more monolithic than the 2015 at the moment. Limpid straw-yellow. Penetrating aromas of fresh citrus and orchard fruits are complemented by hints of chalky minerals and iodine. Juicy and focused on the palate, offering mineral-driven Meyer lemon, Anjou pear and chamomile flavors that show excellent clarity and vibrant lift. The mineral and pear notes carry strongly though an incisive finish that hangs on with impressive focus and tenacity. With its distinctive, earthy, animalistic, herb de Provence, pepper and red berry nose, the wine is full bodied, fresh, intense, concentrated, deep and long. The fruit shows its character with little effort required. The peppery, spicy, garrigue notes that accompany all the dark red berries is really singing. 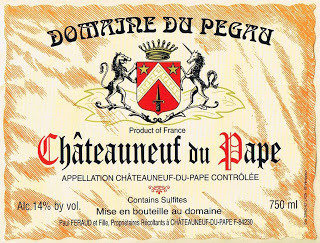 This is one of the top vintages for Pegau and that is really saying something. Time in the cellar will help add depth, complexity and softness to this wine, allowing it to flesh and expand. The wine is a blend of 80% Grenache and various other AOC allowed grape varieties.